Maria Ouspenskaya as Maleva in THE WOLF MAN (1941). Welcome to another edition of IN THE SHADOWS, that column where we look at character actors in the movies, especially horror movies. 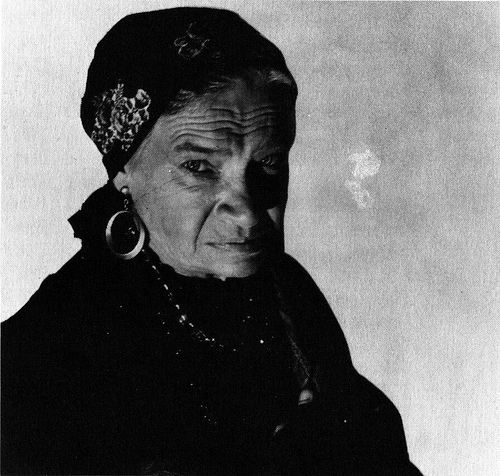 Today we look at the career of Maria Ouspenskaya, the actress most famous among horror fans for her portrayal of the gypsy woman Maleva in the Lon Chaney werewolf films THE WOLF MAN (1941) and FRANKENSTEIN MEETS THE WOLF MAN (1943). As Maleva, Ouspenskaya endeared herself to horror fans as the sympathetic gypsy woman who befriends Lon Chaney Jr.’s cursed Larry Talbot. 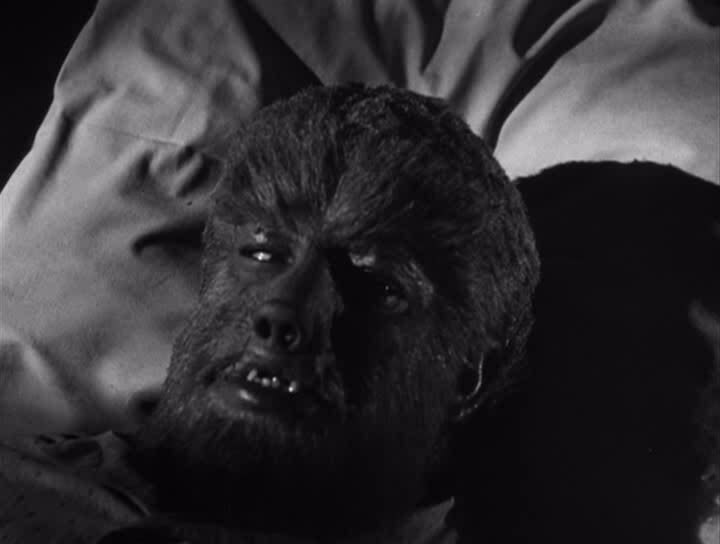 In THE WOLF MAN, it was Maleva’s werewolf son (played by Bela Lugosi!) who bit Larry Talbot and turned him into a werewolf. Later, it’s Maleva who helps Talbot understand his new condition. In the sequel FRANKENSTEIN MEETS THE WOLF MAN, it’s Maleva again who comes to Larry’s aid, this time leading him to Castle Frankenstein in search of Dr. Frankenstein, hoping that he can help cure Larry. 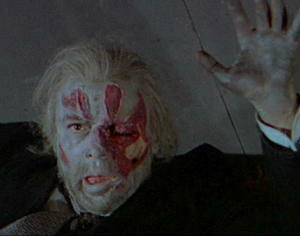 Unfortunately for them, Dr. Frankenstein is dead, and they find the Monster (Bela Lugosi) instead. Ouspenskaya shines as Maleva in both these movies, and she’s one of the highlights of both films. Ouspenskaya taught acting in the 1920s, and she opened her own acting school, the Maria Ouspenskaya School of Dramatic Arts in 1929. Some of her students included John Garfield, Stella Adler, and Lee Strasberg. Strasberg honed his famous Method Acting techniques under Ouspenskaya’s guidance, and Adler went on to teach among others Marlon Brando. Ouspenskaya enjoyed a successful movie career, mostly in non-genre films. It was a brief one, as she didn’t start acting in movies until late in her career, and it was cut short due to an untimely tragic death. DODSWORTH (1936) – Baroness Von Obersdorf- Ouspenskaya’s film career gets off to a rousing start as she’s nominated for an Oscar for Best Supporting Actress in her movie debut at age 60 in this Academy Award winning film by director William Wyler which won an Oscar for Best Art Direction. LOVE AFFAIR (1939) – Grandmother – nominated for an Oscar again for Best Supporting Actress. This film was nominated for six Academy Awards including Best Picture but won none. WATERLOO BRIDGE (1940) – Madame Olga Kirowa- Oscar-nominated World War I romance starring Vivien Leigh and Robert Taylor. THE MORTAL STORM (1940) – Mrs. Breitner – World War II drama (contemporary for its time) about a family in Germany divided by the Nazis’ rise to power. Stars James Stewart, Margaret Sullavan, and Robert Young. DANCE, GIRL, DANCE (1940) – Madame Lydia Basilova – Musical about ballerinas in a dance troupe starring Maureen O’Hara and Lucille Ball. Also stars Ralph Bellamy who would co-star again with Ouspenskaya in THE WOLF MAN. THE WOLF MAN (1941) – Maleva – one of the greatest horror movies ever made, with a superior cast that includes Lon Chaney Jr., Claude Rains, Ralph Bellamy, Evelyn Ankers, Patric Knowles, Warren William, Bela Lugosi, and Maria Ouspenskaya in the role which would make her famous among horror fans. KINGS ROW (1942) – Madame von Eln – Mystery romance starring Ann Sheridan, Robert Cummings, and Ronald Reagan. 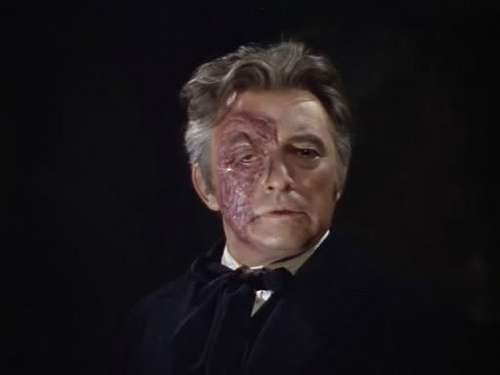 Also features Ouspenskaya’s WOLF MAN co-star Claude Rains. MYSTERY OF MARIE ROGET (1942) – Mme. Cecile Roget – Mystery based on an Edgar Allan Poe tale stars Ouspenskaya’s WOLF MAN co-star Patric Knowles as Poe detective Paul Dupin trying to solve the mystery behind the death of an actress. Also stars KING KONG’s Frank Reicher. FRANKENSTEIN MEETS THE WOLF MAN (1943) – Maleva – reprises her role as Maleva the Gypsy Woman, in this sequel to THE WOLF MAN which brings the Wolf Man (Lon Chaney Jr.) together with the Frankenstein Monster (Bela Lugosi). WOLF MAN actor Patric Knowles plays Dr. Mannering, a different role from the one he played in THE WOLF MAN. TARZAN AND THE AMAZONS (1945) – Amazon Queen – Ouspenskaya is Queen of the Amazon in this Tarzan adventure starring Johnny Weismuller as Tarzan. A KISS IN THE DARK (1949) – Mme. Karina – Ouspenskaya’s final role in this comedy starring David Niven. Maria Ouspenskaya died tragically in December 1949 when she fell asleep while smoking in bed. She suffered severe burns and died shortly thereafter. Maria Ouspenskaya – July 29, 1876 – December 3, 1949. Age – 73. For those of us who love horror movies, Maria Ouspenskaya will always be remembered for her endearing portrayal of Maleva, the strong-willed gypsy woman who was always there for Larry Talbot in THE WOLF MAN and FRANKENSTEIN MEETS THE WOLF MAN. She delivers a masterful performance in both movies. I hope you enjoyed this edition of IN THE SHADOWS, and I’ll see you again next time when we look at another character actor from the horror movies. Today we look at the career of Evelyn Ankers, the Universal starlet best remembered for starring opposite Lon Chaney Jr. in the classic horror movie THE WOLF MAN (1941). She would go on to star in a bunch of horror movies in the 1940s, most of them with Chaney, and when the horror boom died down after World War II, Ankers’ career quieted as well. In the 1950s, while only in her thirties, she “retired” from the big screen to raise a family with her actor husband Richard Denning [THE CREATURE FROM THE BLACK LAGOON (1954)], although she continued to appear on the smaller screen of TV sets across the nation in guest spots on various television shows. She came out of retirement for one last movie role in 1960 co-starring with her husband Richard Denning in NO GREATER LOVE, a drama about Christian missionaries in Africa. 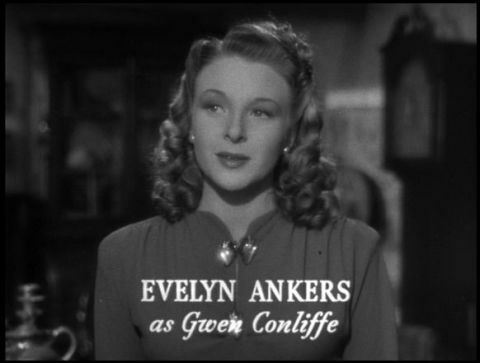 I’ve always enjoyed Evelyn Ankers’ performances in the Universal horror films from the 1940s. She was particularly good as Gwen Conliffe in THE WOLF MAN, the woman who Larry Talbot (Lon Chaney Jr.) falls in love with. The role of Gwen Conliffe was more than the usual standard love interest. For starters, Gwen is engaged to be married to Frank Andrews (Patric Knowles) and so she has no business giving Larry Talbot the time of day, yet she does. Further complicating matters is her fiancé Frank is the gamekeeper for the wealthy Talbots, and so he works for Larry Talbot’s family, a reminder that she— the daughter of a storekeeper— really isn’t supposed to be in the same social class as Larry Talbot. For Larry, he’s taken with Gwen as soon as he lays eyes on her, and Gwen for her part is clearly interested in Larry, not enough to break off her engagement, but enough to take a moonlit walk with him to see the gypsy fortune tellers, a walk that directly leads to Larry’s being bitten by a werewolf. In fact, Gwen is directly connected to Larry’s ill-fated destiny to become the wolf man. She’s the first character to mention werewolves to Larry, citing the “even a man who is pure in heart” ditty. She makes that walk with him to see the gypsy fortune teller, who unbeknownst to them is a werewolf. She’s also the last person to see Larry before he turns into a werewolf for the first time, and he gives her the pendant he received from Maleva (Maria Ouspenskaya) so she can protect herself from the werewolf. And if there’s any doubt about her true feelings towards Larry, at the end of the movie, she’s searching the fog filled woods for Larry, which puts her directly in the path of Larry’s murderous alter ego, the Wolf Man. Gwen Conliffe is a complicated female lead, and Ankers nails Gwen’s character completely. Ankers also starred as Dr. Ludwig Frankenstein’s (Sir Cedric Hardwicke) daughter Elsa in THE GHOST OF FRANKENSTEIN (1942) in which Lon Chaney Jr. played the monster, and she also starred as Claire Caldwell opposite Lon Chaney’s Dracula in the underrated SON OF DRACULA (1943). She’s very good in both these movies. FORBIDDEN MUSIC (1936) – A Lady of the Court – Ankers’ first film role, uncredited. MURDER IN THE FAMILY (1938) – Dorothy Osborne – Ankers’ first credited role in a feature-length film. HOLD THAT GHOST (1941) – Norma Lind – stars opposite Abbott and Costello in this comedy in which Bud and Lou spend time in a haunted house. Larry Talbot (Lon Chaney Jr.) and Gwen Conliffe (Evelyn Ankers) on their fateful moonlit walk through the fog shrouded woods. THE WOLF MAN (1941) – Gwen Conliffe – Ankers’ signature role, and the role she’s most remembered for today. She’s more than just Larry Talbot’s love interest in this film. For starters, it’s a forbidden love, since she’s engaged to another man, and secondly, she’s instrumental in leading him towards his fate of becoming the wolf man, introducing him to the idea of werewolves and being with him on the fateful night when he was attacked and bitten by a werewolf. NORTH TO THE KLONDIKE (1942) – Mary Sloan- co-stars with Lon Chaney Jr. and Broderick Crawford in this adventure about settlers tangling with outlaws in the Klondike. This was actually shot before THE WOLF MAN but released after it, making it the first time she co-starred in a movie with Lon Chaney Jr. THE GHOST OF FRANKENSTEIN (1942) – Elsa Frankenstein- again co-starring with Lon Chaney Jr. Ankers plays Elsa Frankenstein, the daughter of Dr. Ludwig Frankenstein, while Chaney plays the Monster, taking over the role from Boris Karloff. Bela Lugosi’s second stint as Ygor is the best part of this movie, while Chaney’s Monster lacks all of Karloff’s nuances and emotion. Ankers is OK as Elsa Frankenstein, but the role is rather standard. SHERLOCK HOLMES AND THE VOICE OF TERROR (1942) – Kitty – meets up with Sherlock Holmes (Basil Rathbone) and Dr. Watson (Nigel Bruce) as they take on the Nazis. CAPTIVE WILD WOMAN (1943) – Beth Colman – Universal monster movie where mad scientist John Carradine turns a female gorilla into a human woman. SON OF DRACULA (1943) – Claire Caldwell – Once more Ankers plays opposite Lon Chaney Jr., this time going up against him as he plays Count Dracula. Her role in this one is rather peripheral, as the main heroine in this underrated thriller from Universal is Louise Albritton as Claire’s mysterious sister Katherine who loves the supernatural and actually allows Dracula to make her a vampire so she can in turn make her true lover Frank (Robert Paige) immortal and ditch Dracula! Take that, Drac! I told you this one was underrated. 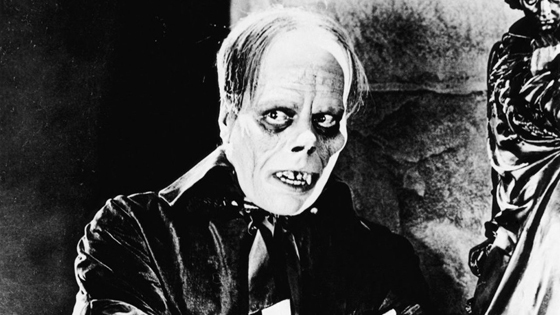 I actually really like Chaney’s interpretation of Dracula. While it’s not Lugosi, it is a far cry from his sympathetic Larry Talbot, and it’s nice to see Chaney play a true evil character. THE MAD GHOUL (1943) – Isabel Lewis- another mad scientist movie, this one with George Zucco, Robert Armstrong and Turhan Bey, about a scientist who turns a student into a ghoul. WEIRD WOMAN (1944) – Ilona Carr- Back with Lon Chaney Jr. again, Ankers plays a woman suspicious of Chaney’s new wife, who has an island native heritage and is mixed up with voodoo. She’s one weird woman! JUNGLE WOMAN (1944) – Beth Mason – it’s the return of the ape woman from CAPTIVE WILD WOMAN, this one with J. Carrol Naish. THE INVISIBLE MAN’S REVENGE (1944) – Julie Herrick – The third film in the INVISIBLE MAN series, none of them direct sequels, follows a fugitive Robert Griffin (Jon Hall) who becomes invisible and then exacts revenge on a family he believed had cheated him. Ankers’ Julie is the daughter of the couple Griffin terrorizes, and she’s also the object of his affection, although she is not interested in him. Smart girl! THE PEARL OF DEATH (1944) – Naomi Drake – back with Sherlock Holmes (Basil Rathbone) and Dr. Watson (Nigel Bruce) again, this time in a tale about murder and a valuable pearl. 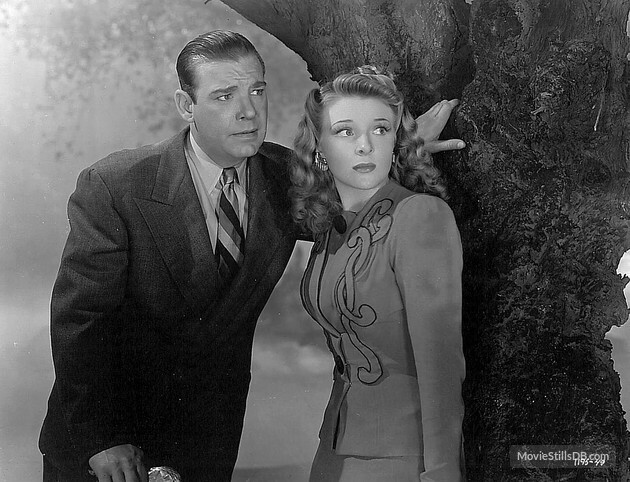 THE FROZEN GHOST (1945) – Maura Daniel – Ankers co-stars with Lon Chaney Jr. for the last time in this thriller about a mentalist (Chaney) who feels his powers are to blame for a man’s death and decides to get away from it all by hanging around a mysterious wax museum. Hmm. I think he needs a better travel agent. Ankers’ final genre film. BLACK BEAUTY (1946) – Evelyn Carrington – co-stars with her husband Richard Denning in this horse drama. TARZAN’S MAGIC FOUNTAIN (1949)- Gloria James Jessup – Tarzan film written by THE WOLF MAN screenwriter Curt Siodmak starring Lex Barker as Tarzan in a tale involving the fountain of youth. NO GREATER LOVE (1960) – Evelyn Ankers’ final film appearance, co-starring with her husband Richard Denning in this tale about missionaries in Africa. While I’ll always remember Evelyn Ankers for her role in the classic THE WOLF MAN, she added a lot of class to a lot of other movies as well, especially horror movies from the 1940s, and I certainly enjoyed her performances in such films as THE GHOST OF FRANKENSTEIN and SON OF DRACULA. Evelyn Ankers passed away on August 29, 1985 from ovarian cancer. She was 67.